Our self rescue course is two days long but can be split into two single day courses if this works best for your personal schedule. Day one will cover the basics such as friction hitches, rescue specific knots, and basic hauling systems. On day two we will break into advanced multi pitch techniques such as rescuing the injured leader or second and assisting them to safety by ascending or lowering and rappelling. 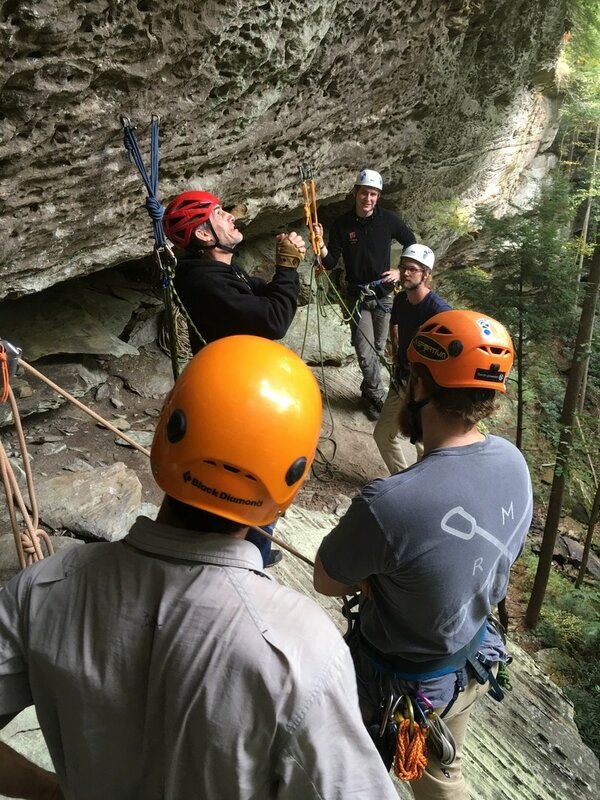 With Appalachian climbing school you will learn the most up to date and efficient systems being used by AMGA guides today. No complicated confusing systems, we focus on simplicity and efficiency. All the skills taught in this course are useful in everyday climbing and will improve both your speed and safety on the rock. • Belay escapes (also how to stay out of the system in the first place.). • Raising and lowering systems. • Ascending fixed and counterbalanced ropes. • Multiple uses of belay devices (Gri-Gri’s, ATC-guide, Reverso’s etc.). • Multi-pitch rappeling with an injured climber. Have a larger group? Other questions? Contact us for a special quote or more details!